Whether you’re a car enthusiast or you just happen to own a car, one thing is universal. We all hate tire sling. Going to a car show to present or driving the kids to soccer practice, it doesn’t matter. A clean car that has tire dressing slung all over the side of the car stinks. It looks nasty, gets into your quality wash mitts and can be a paint to completely remove. As a professional car detailer in the Atlanta area, I get requests all the time to show clients how to clean and dress tires in a way that will not sling. What this article will do is discuss how tire sling happens and what you can do to keep it from happening to your car. Why is tire sling a thing? The short story is that tire sling happens because there is either too much product on the tire and centrifugal force slings the excess away from the tire, or there is not enough bond for the tire dressing on the tire. What could cause there to be too much product on the tire? At most detail shops, they are all about volume. This translates to as little time put into each project as possible. 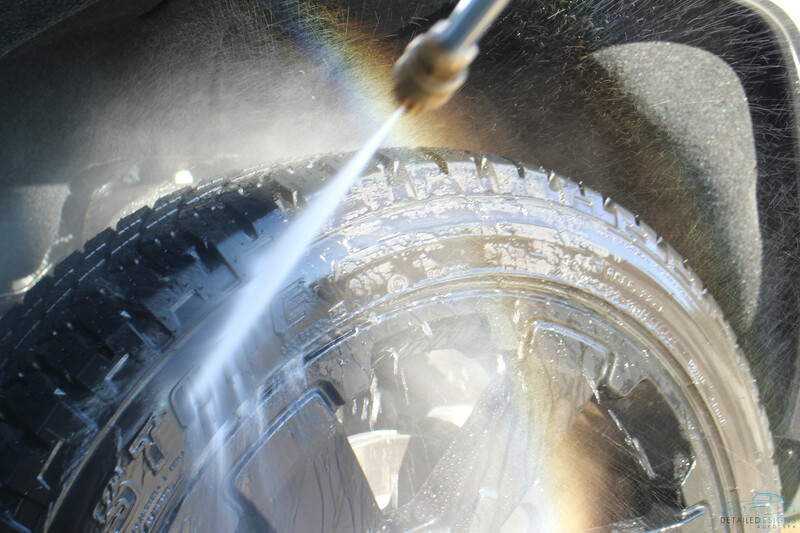 What most do is quickly spray the dressing on the tire and not bother to wipe down the tire. This leaves the tires with an incredibly wet look that many customers like. The problem with this method is there is far too much tire dressing on the tire. Along with the issue outlined in the previous paragraph, most shops use petroleum-heavy dressings. When used, these dressings lay super thick but do not bond very well. Both issues really snowball the more they are used over the life of a tire. As a side note, petroleum-heavy dressings also degrade the elasticizers in rubber products, which cause accelerated aging. If you plan to continue using these petroleum-heavy dressings, you can minimize tire sling by wiping down the excess dressing with a towel of low value(well…it will be of low value when you finish using it…). We are fans of using quality dressings that, by nature, do not sling with proper application. Moving forward, if you desire amazing looking tires that do not sling, we must start by removing the garbage dressing that is on your tires now. 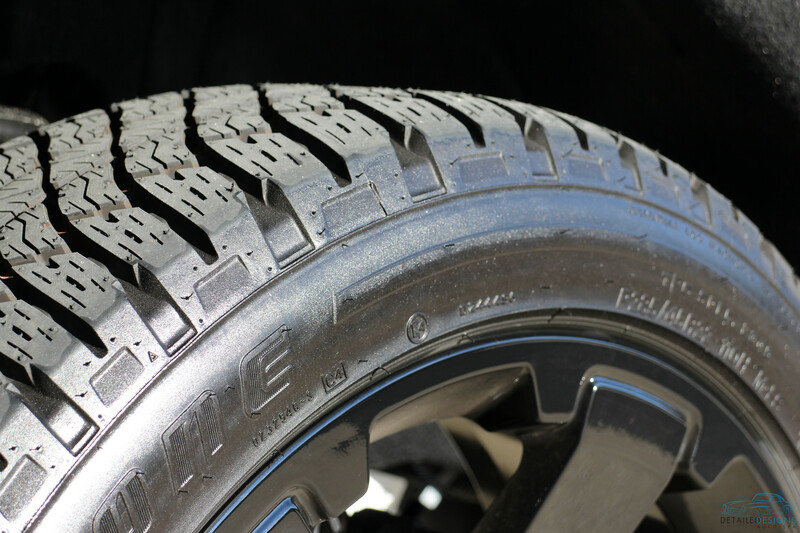 Assess the tires to see the extent of the tire gunk. In this case we are using a client’s new vehicle. The tire gunk we are removing was used by the dealership. It slung gunk all over the side of the vehicle. 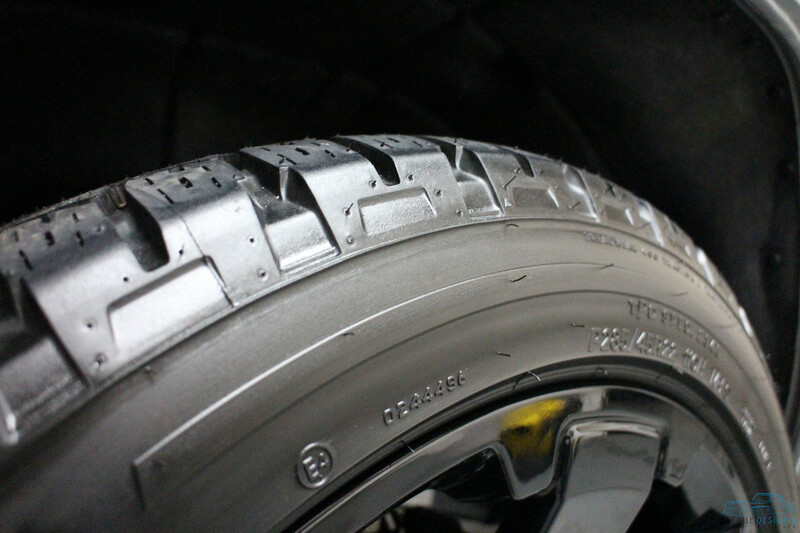 You can use your finger or a towel to see how poorly the dressing bonds with the tire. The ideal dressing will be dry to the touch and not transfer. This tire has some major transfer. 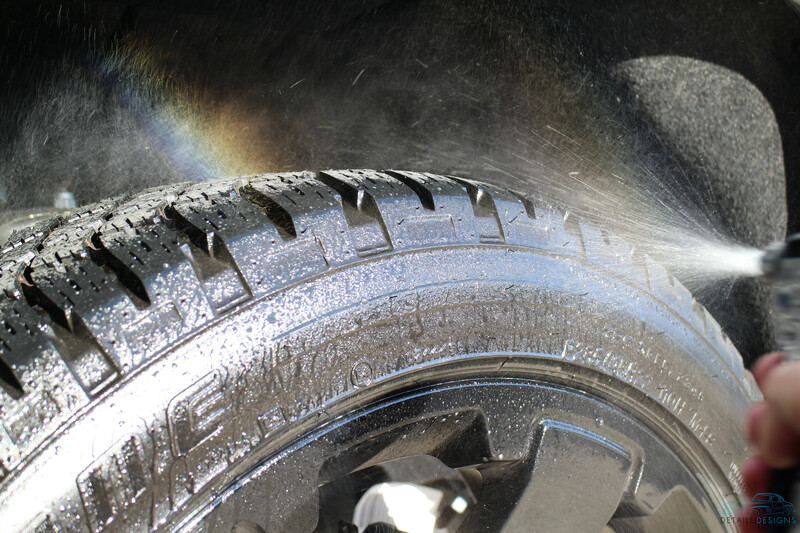 Once your all purpose cleaner is mixed properly, spray directly to the tire. 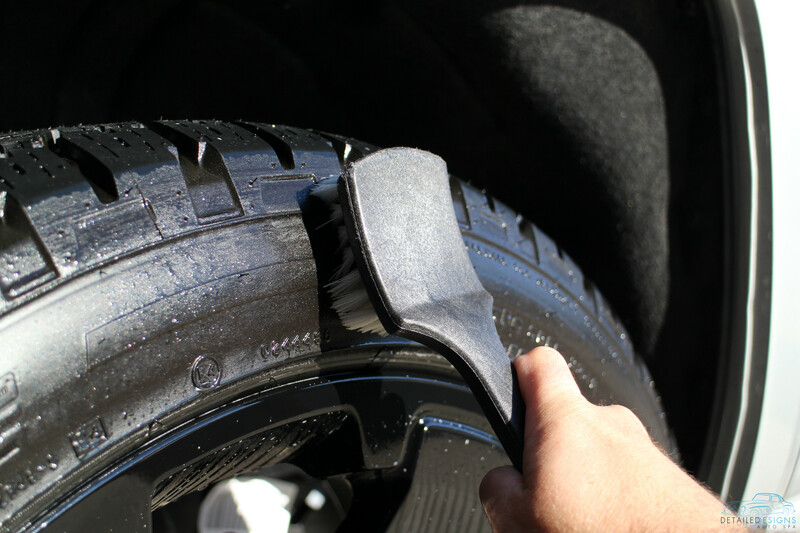 Use your stiff bristle brush to agitate the surface of the tires. Ensure that you agitate in multiple directions to allow the bristles to gain access to the low and high spots on the tires. After working a manageable area enough, flush with your pressure washer. This is a common sense task. If you manage to cause damage to a rubber tire with a pressure washer, please step away from the pressure washer and reflect on the life choices that lead you to this spot. haha! -Just kidding…but seriously, it is difficult to cause damage to the tire. But you can cause damage to your wheel and other sensitive areas of the car. Please be cautious while using a pressure washer. 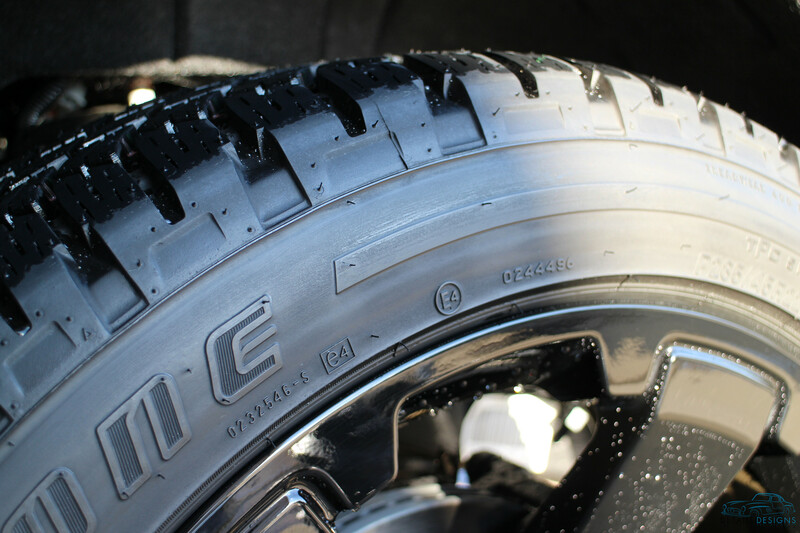 We have some incredibly steady hands and use the pressure as added cleaning ability for tires. Use a towel or your finger to test for gunk transfer. 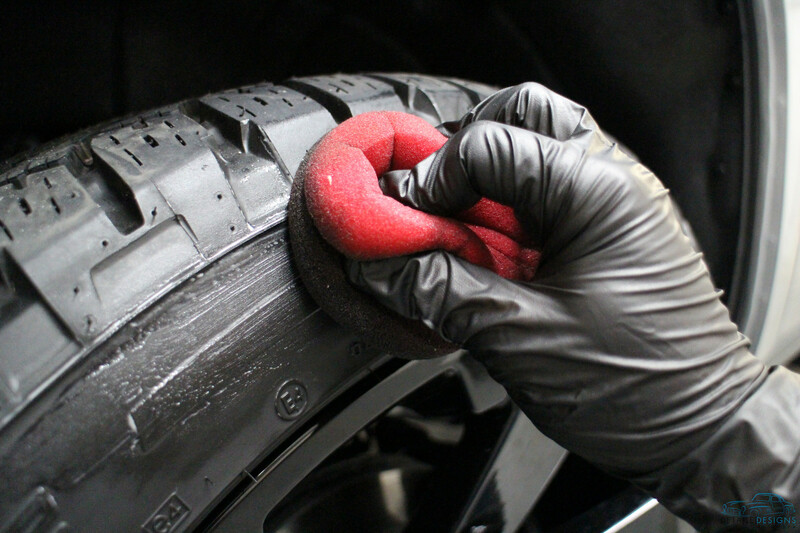 If you’re still getting old tire dressing on your finger or towel, repeat these steps. When decontamination of the tire is complete it should have a nice matte sheen. Once the tire is cleaned, this is a good opportunity to clean the wheel and wheel well. Now that all of that tire dressing nastiness is removed, you should have a wonderful surface to apply your quality sealant/dressing to in a way that promotes bonding. The next step is choosing and applying a quality product. There are a lot of different quality products that are available to the automotive enthusiast. We are big fans of Ultimate Tire and Trim Guard Plus (like all other products used in this article, UTTG+ is available for purchase at our shop). As a polymer, it bonds very well and has a nice lifespan and it can be layered without fear of slinging. UTTG+ only requires a small amount to be applied to the sponge you use to apply the product. 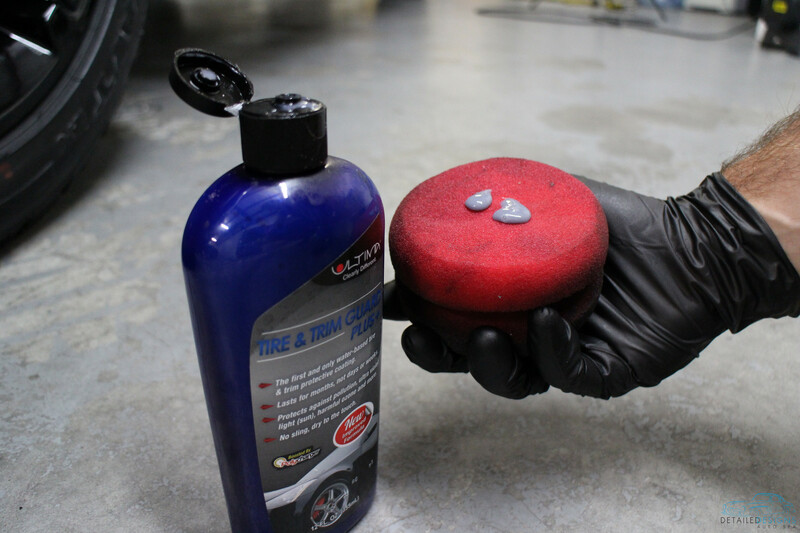 With a manageable amount of product on your sponge, apply the product in a way that increases the chances to get coverage on the low and high spots of the tire. We work the product in every direction that we can. For UTTG+, we wait 10 minutes or longer between applications. Depending on how the tire responds to the coatings, we may wipe the surface with a towel between applications. But after the last application, we will always wipe the tire with a towel to ensure there are no high spots. This promotes as even a finish as possible. These tires received 3 coats of UTTG+ with about 10 minutes between applications. The final result was tires that had zero product transfer and looked amazing. Regular on-going care will result in tires that look beautiful and remain easy to maintain.